I love all the Alien movies, even the bad ones. For the most part this is because of the xenomorphs, not the humans. 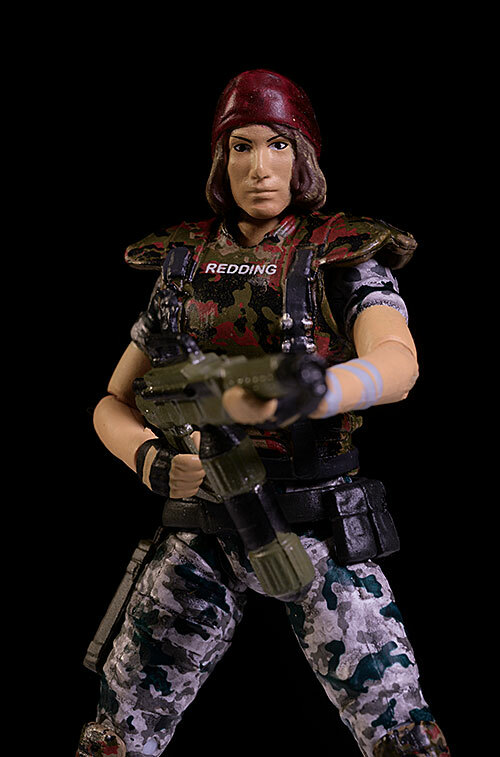 Sure, Ripley is fantastic...but she's about it for 90% of the human side of the franchise. The only exception is the colonial marines in Aliens, a rough group of bad asses that might not last all that long but make an indelible impression. 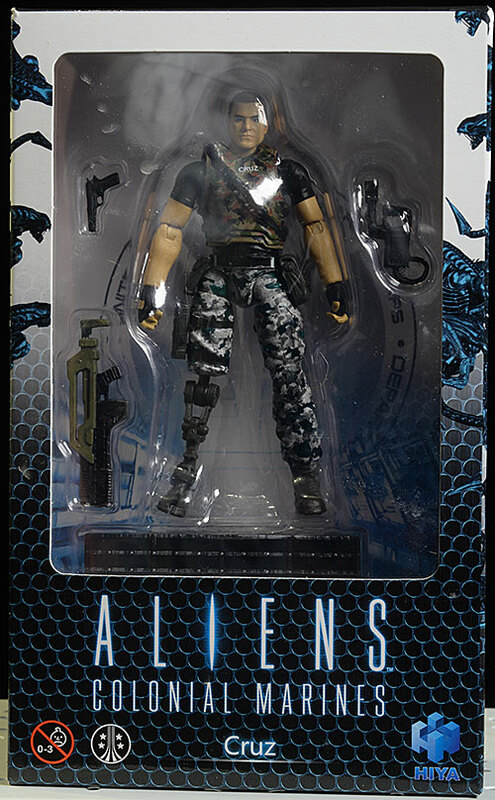 As part of their Aliens figure series, Hiya Toys has produced several 4" scale marines. 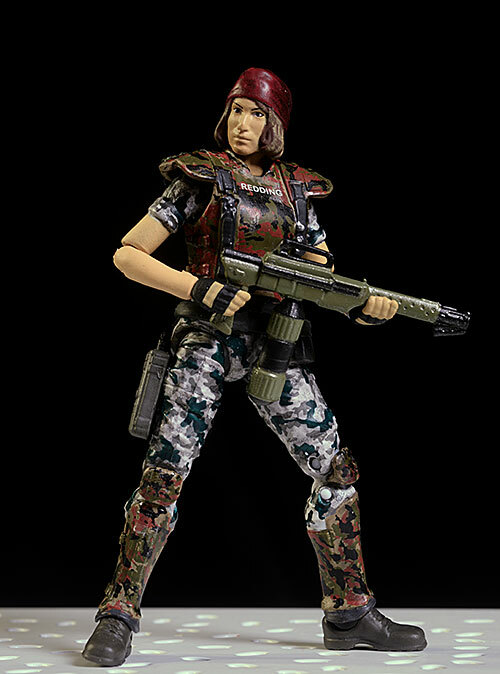 The latest set is based on their appearance in the video game Aliens: Colonial Marines. Technically, these three - Cruz, Bella, and Redding - are a Previews Exclusive, but that just means they'll be available at most comic book stores and online dealers. This is a bit of an early review, but they should be shipping very soon. Expect to pay about $20 each. I also have two of the new Aliens to cover, so look for that in the next week or so. 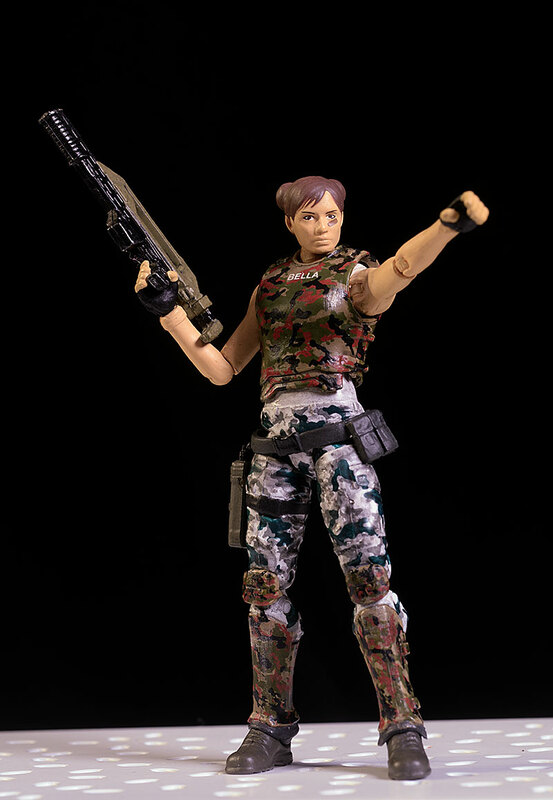 As with the previous wave, these come in small boxes, with a large window to show off the figure and accessories. It's very collector friendly, with a plastic tray and cover holding the figure and accessories safe. You can even use the background inside the box as a backdrop for the display. This set includes one man - Cruz - and two women - Bella and Redding. All three have similar body sculpts, although the arms and legs are a little thinner on the ladies, and they are slightly shorter. Cruz is about 4" tall, while Bella and Redding come in at just over 3 3/4". They'll fit in scale wise with the earlier marines of course. The portraits are all extremely good for figures this size. I'm particularly impressed with Cruz, who has a sharp, well defined expression and facial structure. The two females are a little softer in detail, particularly on the nose and lips, but are still extremely good portraits for this scale. 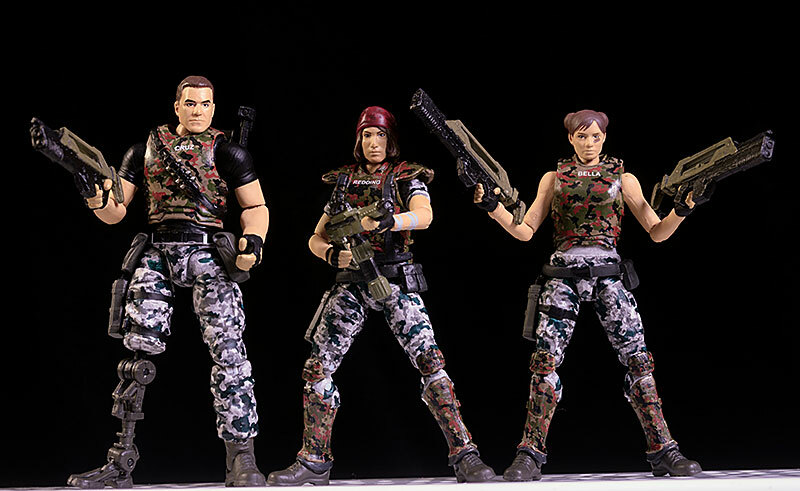 They varied the flak vest on all three to make the costumes distinct, adding shoulder pads or straps, etc. They also have sculpted holsters and belts, and the pants have the appropriate folds and wrinkles. Cruz sets himself apart even further with a mechanical prosthetic leg. You have to be pretty damn dedicated to lose half a leg and go back for more. My only gripe is with the hands. Neither is great at gripping the gun, thanks to very short thumbs and a weak design. But you can get them to work, particularly with the handguns and the pulse rifle. The paint is solid work, but not quite as good as the overall sculpt. The camo detailing looks fantastic, but some of the edges, particularly along the sleeves and straps, are fuzzy and uneven. The eyes vary a bit - Cruz is great, Redding not so much - and even the printed names are somewhat inconsistent between the figures. The skin tone is even and matches between the face and arms, but there's some gloppiness to it, with some brush marks and dirt embedded. 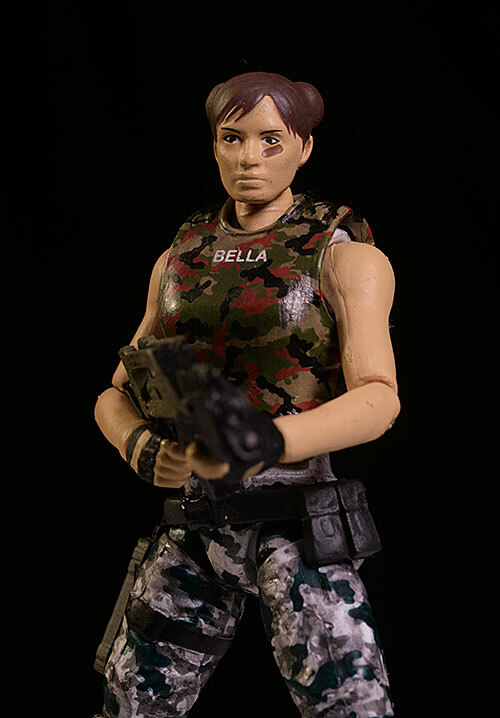 Dear Bella has one other weirdness - it looks like she has a sculpted 'cuff' of some sort on her right wrist, but it's painted flesh color. Still, one has to remember the scale here, and while the quality could be better, it's solid B work overall. These little suckers are loaded with articulation, and posing them is relatively easy. The ball jointed necks provide some tilt and lean, along with plenty of spin. The rotating hinge shoulders, elbows, and wrists allow for two handed gun poses, but I was a little worried about the elbows. They seemed softer this time, and you'll want to take care not to tear anything. The lower body includes a cut waist, double rotating hinge hips, double pins knees, and pin ankles. There's not a ton of rocker movement in the ankles, but you can get decent deep stances with a little effort. Cruz has a slight variation on this, due to the mechanical leg. That knee is a single pin, as is the ankle. These three aren't quite as heavily equipped as the earlier releases, but they still pack a punch. All three have handguns which fit in the holster on their hip. 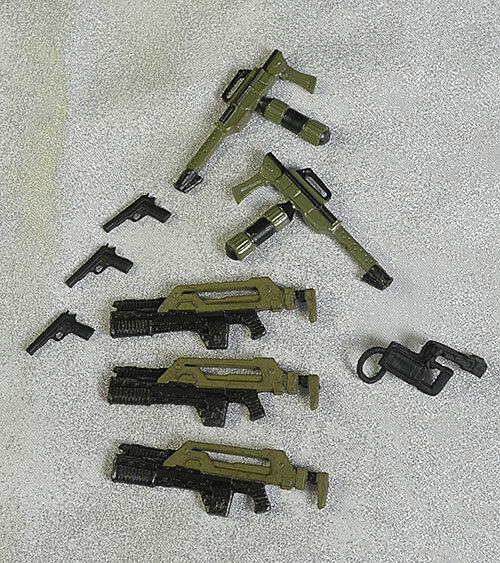 They also all have their pulse blasters, as well as their flamethrowers. 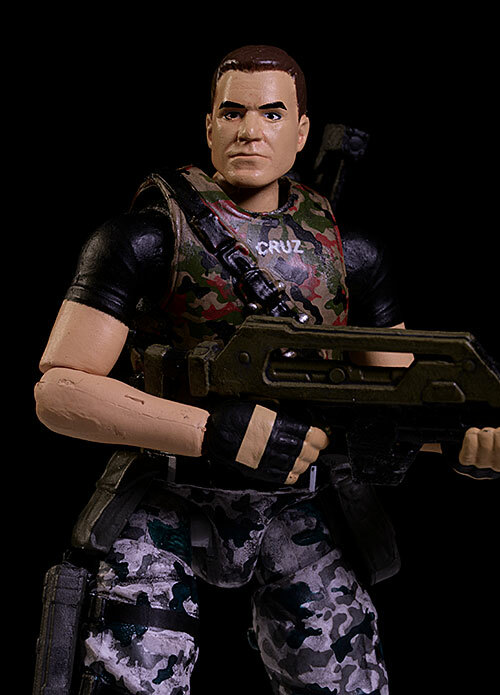 Well, except for Cruz - he forfeits the flamethrower for the shoulder pack that attaches to his back via a peg. Each figure has a square display stand with a grid surface, like the industrial floor of the ship. There's also two small black connectors, which allow you to hook the bases together to create a large diorama. You won't need the base for them to stand, but it's a nice way to keep them upright long term. While there's technically a nit here or there, this are really fun figures. Setting them up in battle with the various Alien characters is a lot of fun, and can be shared between old and young fans. 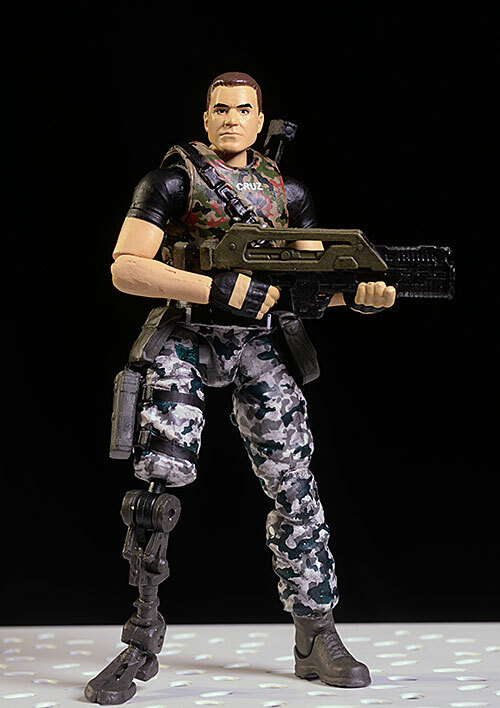 The early wave of the Marines was $25, but this time they are coming out at $20. I'm bumping them a half star up in this category, and while they still haven't quite hit 'average', the price is less of an issue at this point. As I mentioned, the elbows on a couple of these seemed a bit flimsy, so you'll want to take care when you're first posing them. I also had to dig out the hole on the back of Cruz to fit the pack. There was some paint down in there making it impossible to attach it, but it was pretty easy to clear it out. Fans of G.I. Joe don't have a lot to love these days. 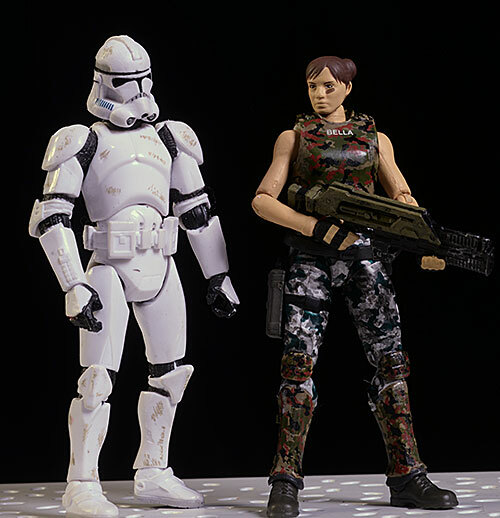 Even fans of the 1/18 scale in general have been left hanging out to dry by most companies as they flock to the 1/12 scale. 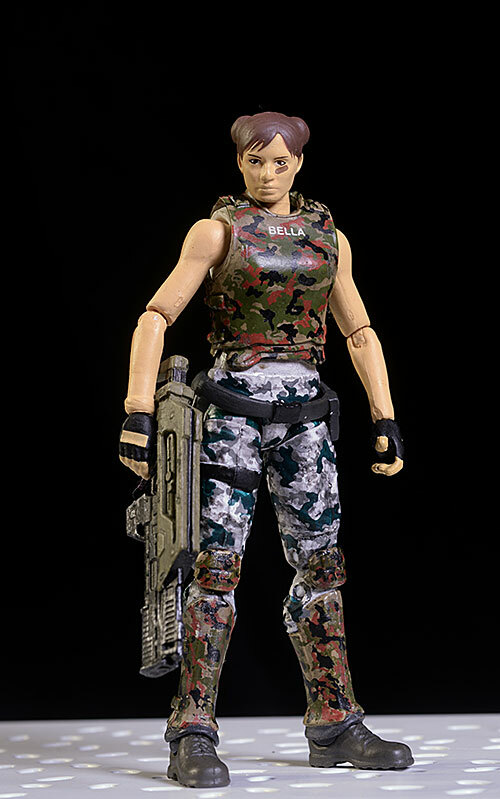 This makes it all the better when a company takes a beloved license and creates military style characters with great articulation and nice extras. I'm going to review a couple of the xenomorphs shortly, and you can expect these guys to show up in the photos! 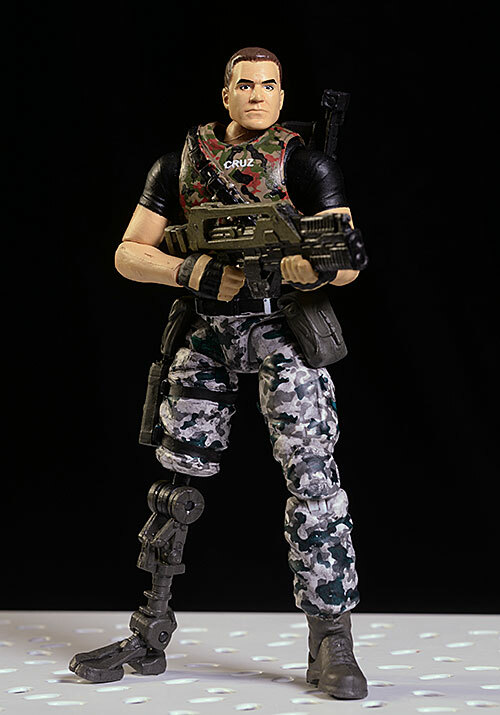 I've looked at some of their other Colonial Marines, as well as their small Predator figures.